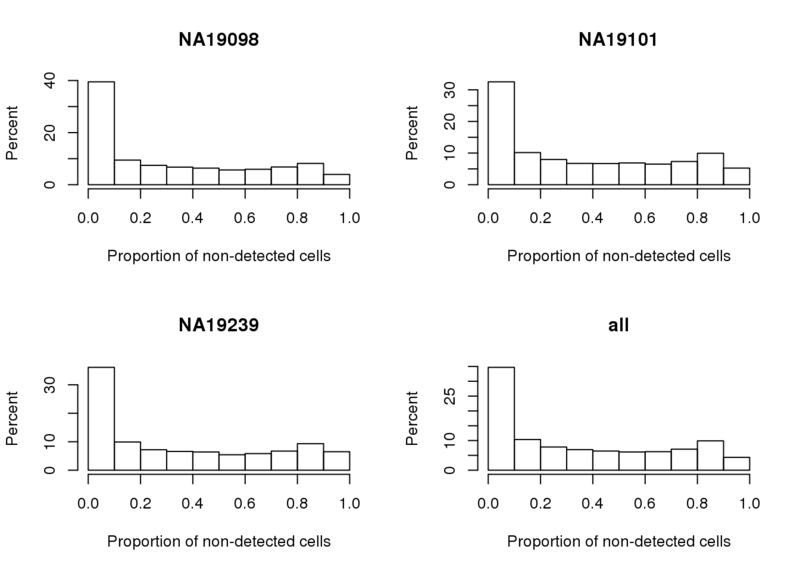 Non-detection rate descriptives: We found that the median of non-detected cells rate is 26% across the three individuals and ranges between 21 to 30% between the three individuals. 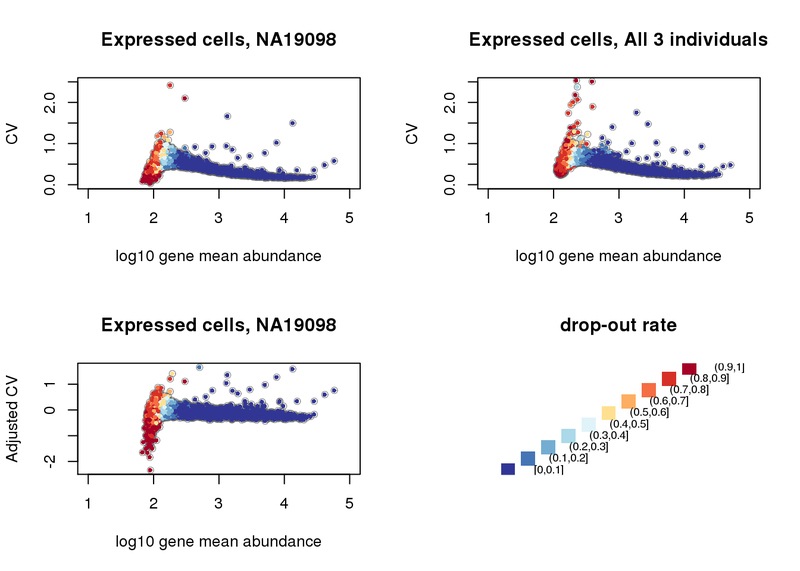 Non-detection rate and Mean, Var, CV: Expectedly, gene abundance and variance were both associated with percent of non-detected cells; even genes with as low as 10 percent of non-detected cells were restricted in the dynamic range of abudance levels. 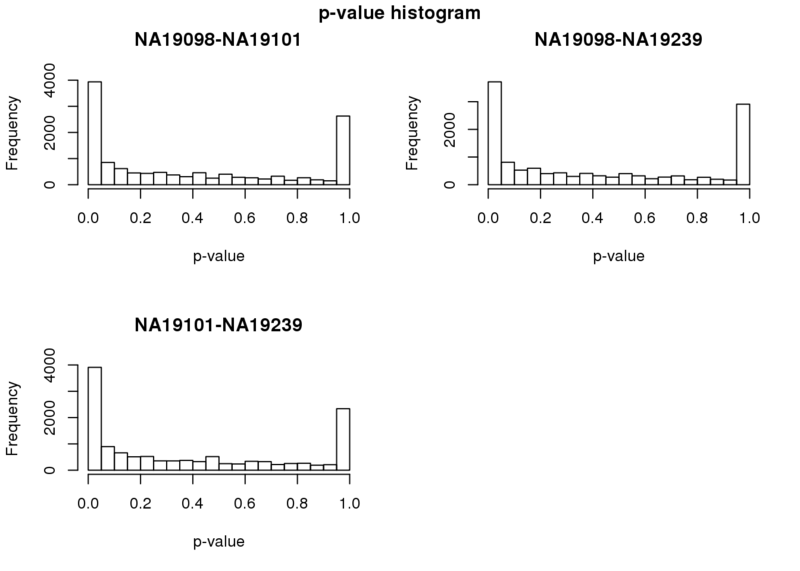 Gene coefficient of variation was not correlated with percent of non-detected genes (Spearman’s correlation = .04) across the three individuals. 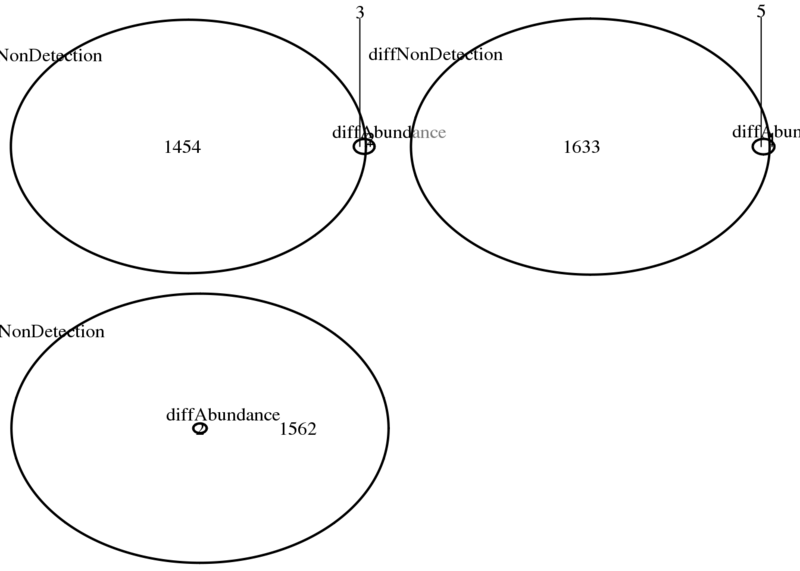 Further analysis indicated that when including only cells with less than 50 percent of undetected cells, the gene CV decreases as a concave function of abundance, a commonly observed pattern in bulk RNA-seq data and in scRNA-seq when undetected cells are included in the analysis. 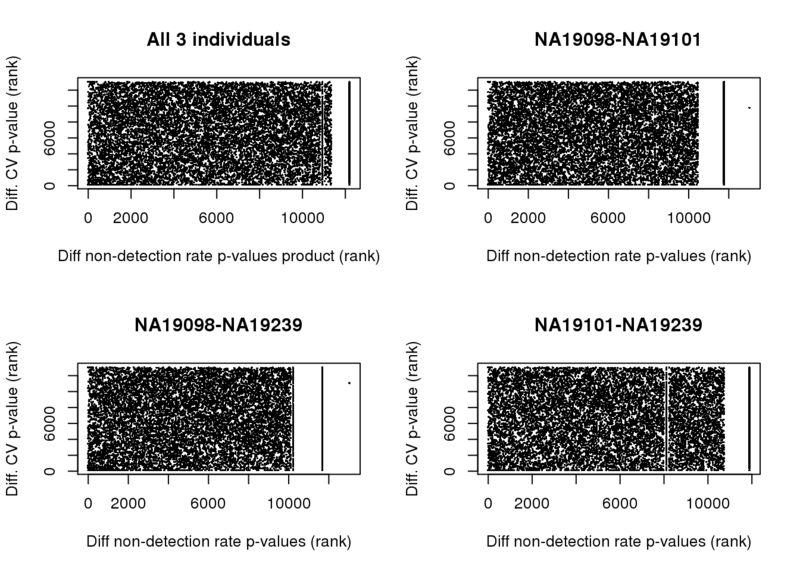 Compare non-detection rates: 1,958 genes were found to have significant differences in non-detection rates between the three individuals at false discovery rate less than .01. 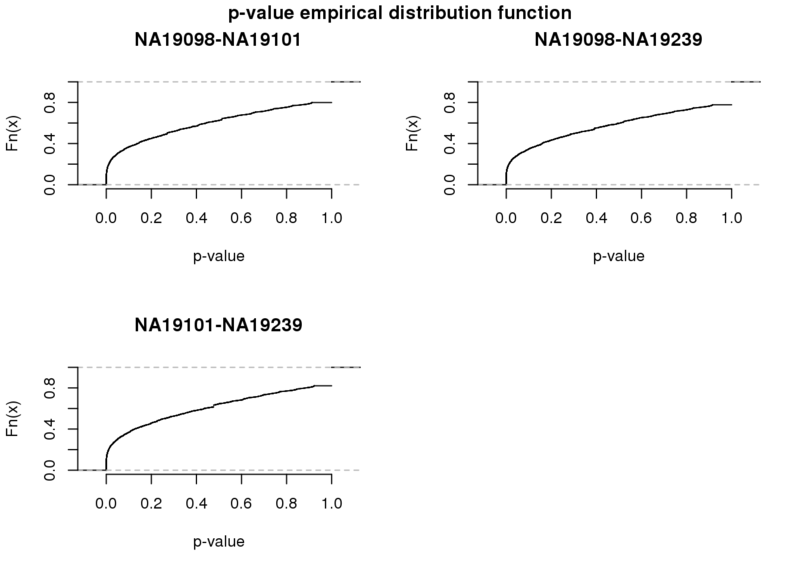 Individual difference in non-detection rate and gene abundance: We found no correlation between p-values of tests comparing gene mean abundance and p-values of tests comparing non-detection rate, for all three pairiwse between-individual comparisons. The results also held when we investigated the correlation between fold change and p-value of tests comparing non-detection rate between indivdiuals. 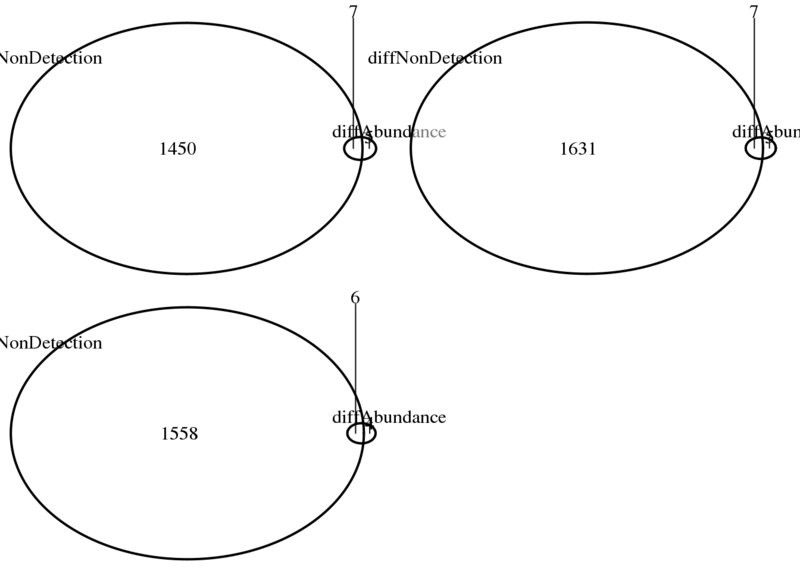 Furthermore, we evaluated genes with absolute log2 fold change greater than 1, 1.5, and 2 in the pairwise comparison tests, most genes with our nominated fold change difference were found to not have a significant difference in the proportion of non-detected cells. *Note: I don’t trust the differential expression analysis results here. 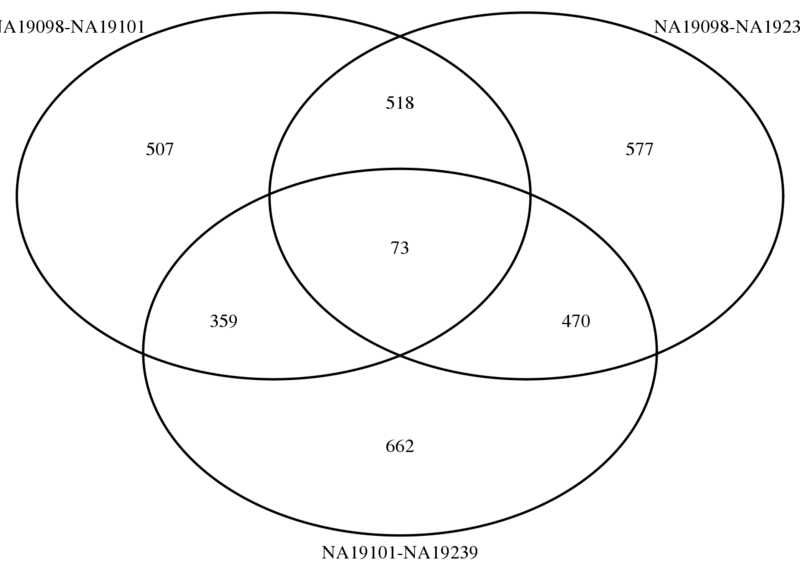 Over 95% of the genes in the overall F-test were to be significant at FDR < .01; same results were found for two of the pairwise comparisons (NA19098-NA19101, NA19098-NA19239). 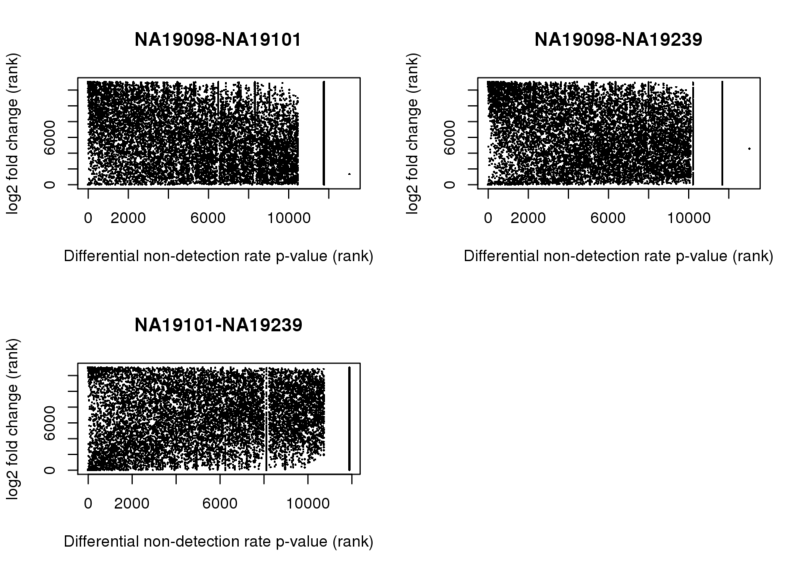 When looking at the fold change of gene expression, I found only a very small portion of the genes with log2 fold change more than 2; NA19098-NA19101: 5 genes, NA19098-NA19239: 4 genes, and NA19101-NA19101: 2 genes. 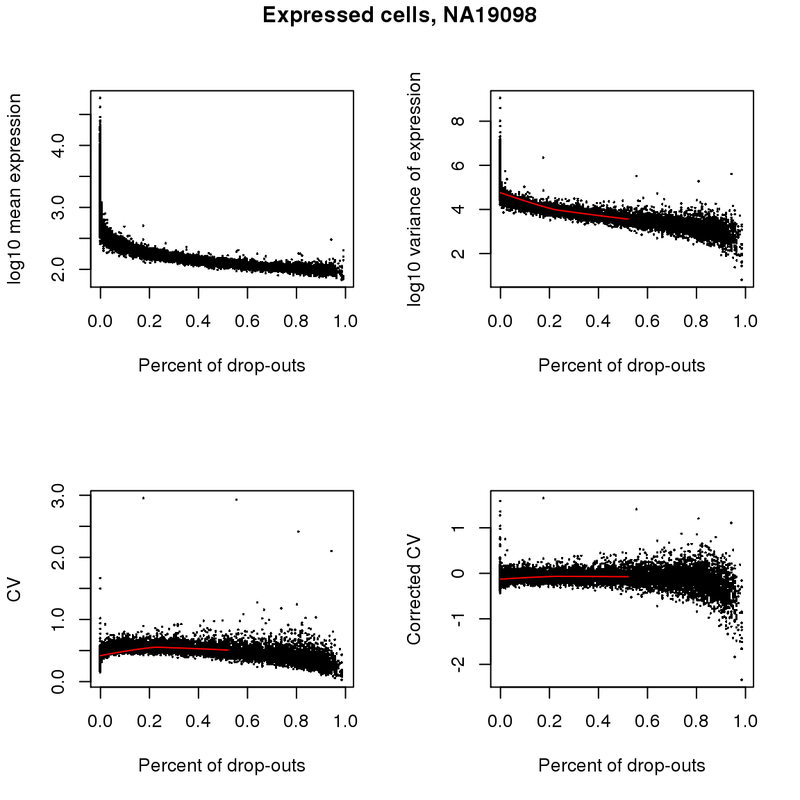 Non-detection rate and adjusted CV of the expressed cells: Similar to results with gene abundance, we found no correlation between individual differences in non-detection rate and adjusted CV. At FDR < .01, of the 679 genes with differential adjusted CV of the expressed cells, only 69 genes were found to have significant difference also in proportion of undetected cells in at least one pair of between individual comparisons. We import molecule counts before standardizing and transformation and also log2-transformed counts after batch-correction. Biological variation analysis of the individuals is performed on the batch-corrected and log2-transformed counts. 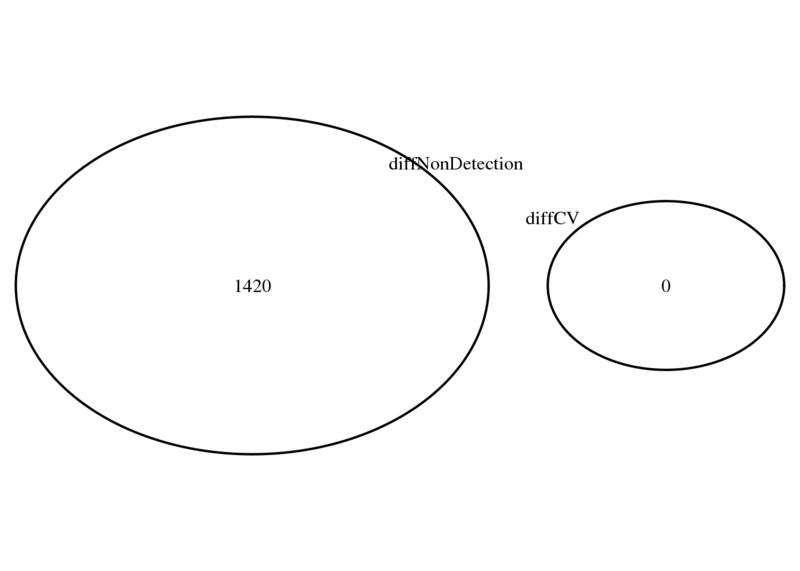 Load gene CVs computed over all cells (link1), CV computed only over the expressed cells (link2), and differential CV results when including only the expressed cells (link3). 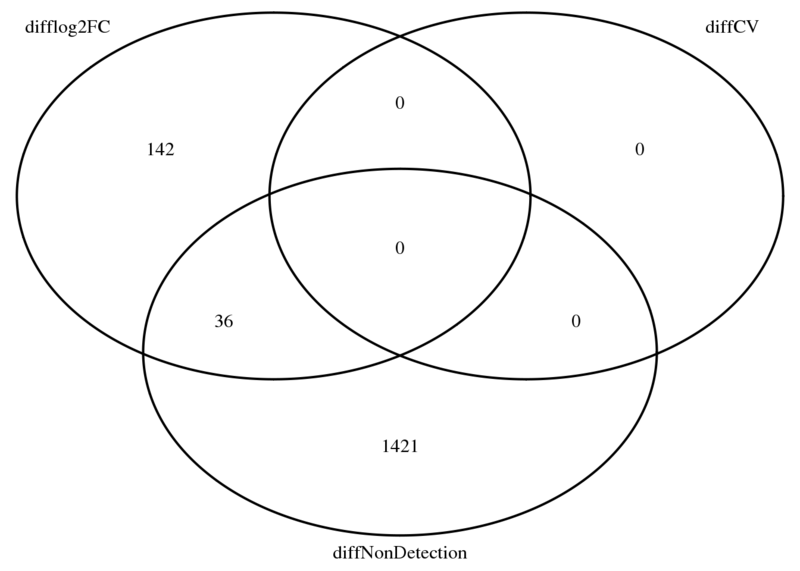 Compute a matrix of 0’s and 1’s indicating non-detected and detected cells, respectively. 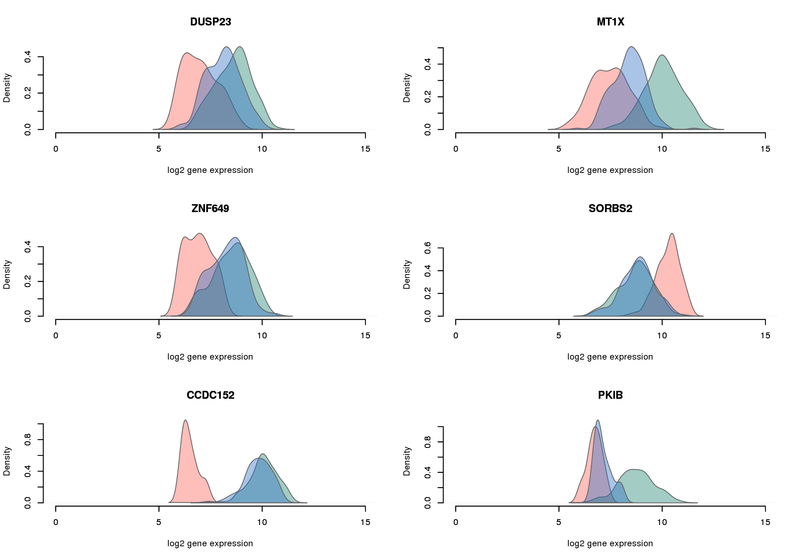 Take the gene subset included in the final data. Proportion of genes with 50 percent or more undetected cells. CV and mean plus drop-out rates. Fisher’s exact test for between individual comparisons. 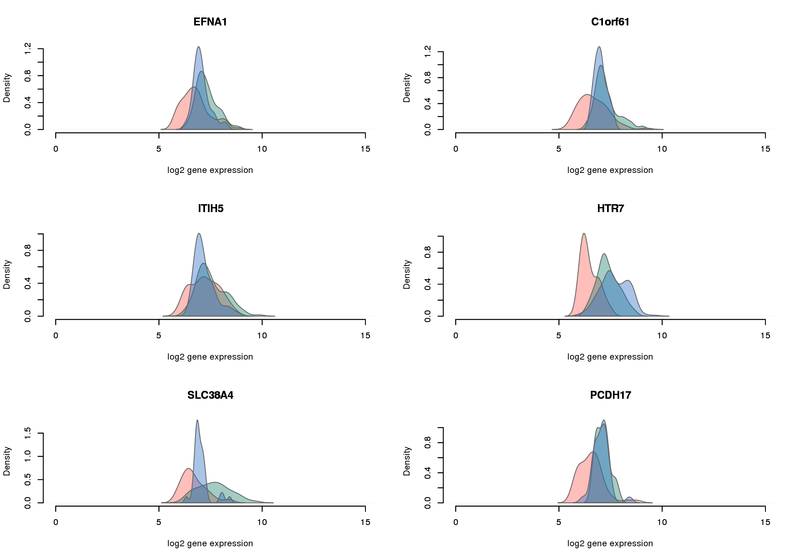 For some genes, we observed no undetected cells, a scenario that calls for Fisher’s exact test instead of Chi-square test or logistic regression. "abs. log2 FC > 1"
 "abs. log2 FC > 1.5"
 "abs. 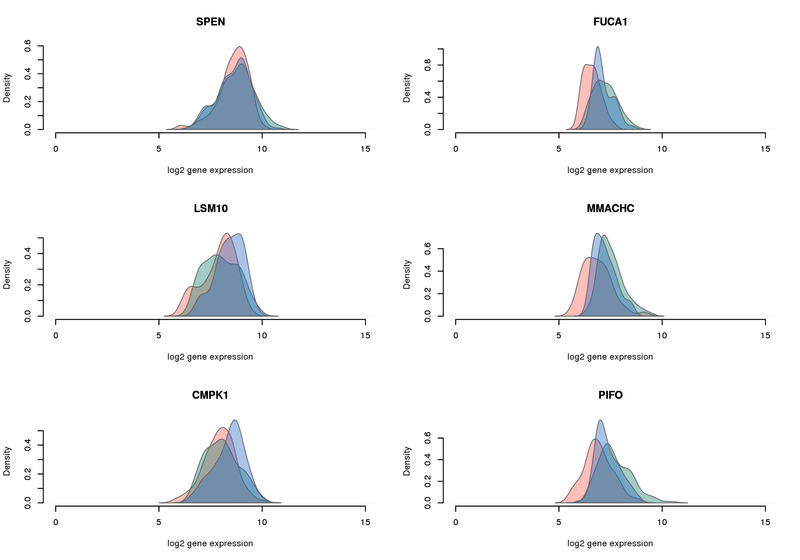 log2 FC > 2"
Overlap of genes with at least one significant pairwise difference in proportion of detected genes, and genes with significant differential CV. 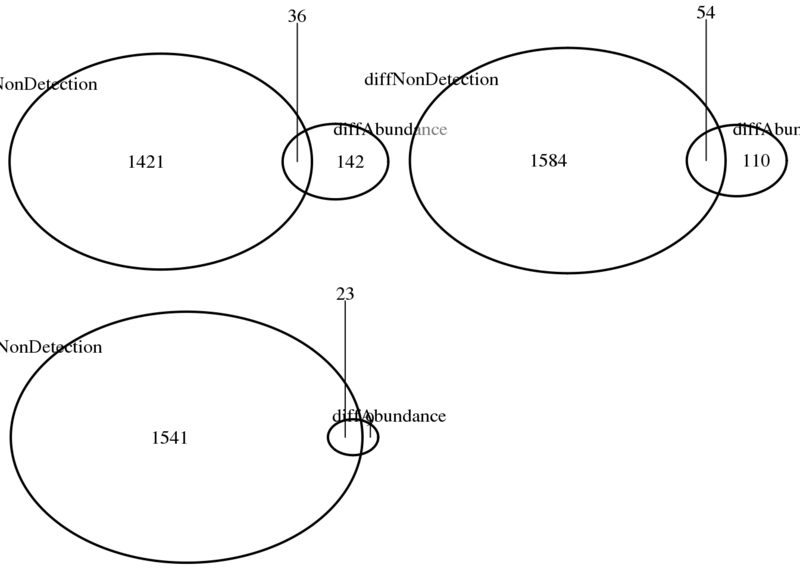 Overlap of genes with significant difference in proportion of undetected genes between all three pairs and overlap of genes with significant differential CV genes.